How to transfer data from iPhone to PC and from PC to iOS device (iPhone, iPad, iPod)? 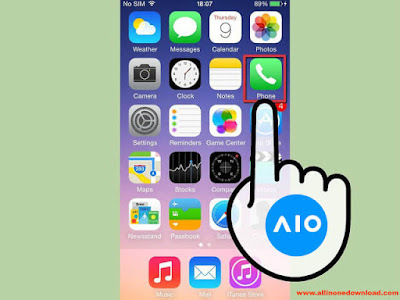 Hello friends, In this post we will teach you to manage your IOS Device like iPhone, iPad, iPod from your PC. So friends, if you want to know this, then read our post till the end. Friends, if you want to transfer your data from your IOS Device to your PC or transfer your data from your PC to your iOS Device. So it is very important for us to read this post for you. Because in it we are going to give you information related to data transfer. Besides, you can download any video from the Internet and keep it in their IOS Device. Simultaneously, you can also clean your IOS Device. 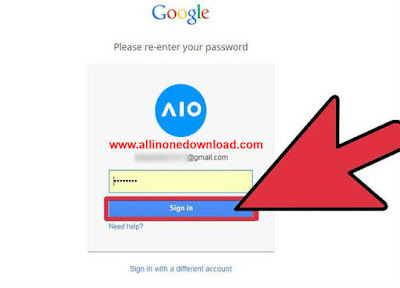 For transfering this you will require a software to transfer data from PC to your iPhone to PC and to iPhone. Which we will tell you the name of that software is "IO Transfer". With the help of this software, you will be able to manage your IOS Device, not just Data Transfer. 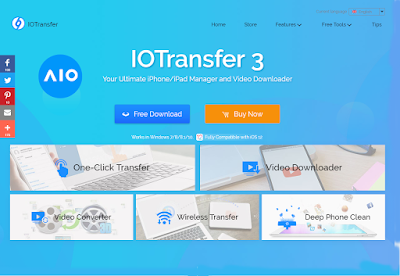 So users, if you want to know more about the IO Transfer Software, then read our post till the end. 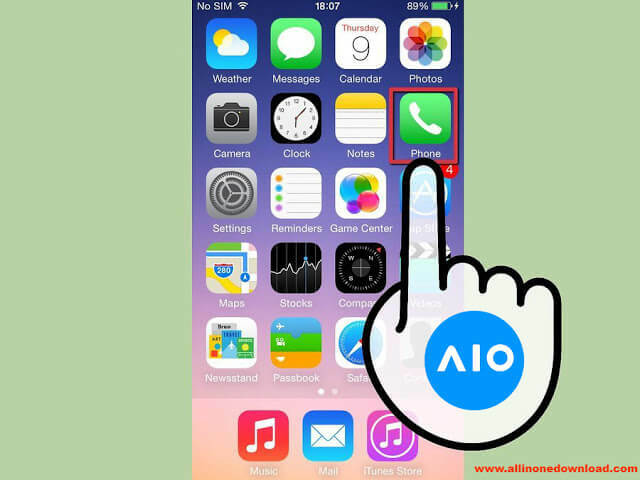 After downloading this software you will be able to manage your IOS Device in the better way. Step 1. First of all click on this below link to download and install the iPhone Manager Software (IO Transfer) in your PC. Step 2. 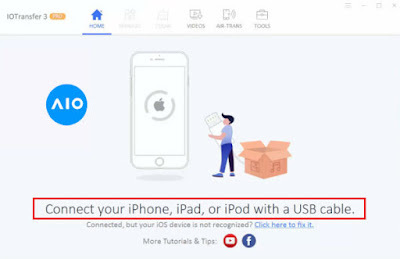 Now you have to open this software and connect your iPhone through USB in the PC. Step 3. Once you connect your iPhone to your PC, you will be able to see all the data from your iPhone on your PC. 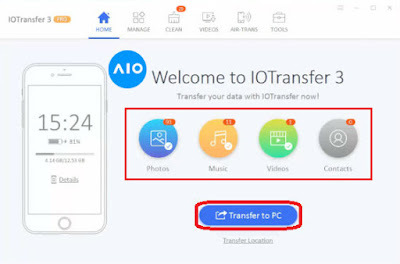 Now, you can click on Transfer To PC to transfer all your iPhone's data to your PC. Step 4. 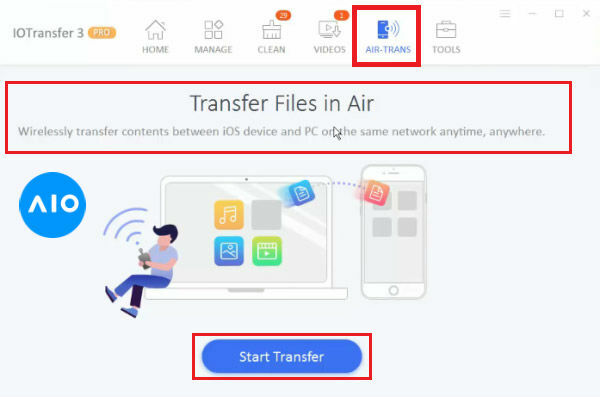 You can also transfer your data in air using Air-Trans Option. Step 5. If you click on Manage, then you can also manage your iPhone from your PC. So following this process you can easily transfer data from your iOS Device to your PC or from your PC to your IOS Device. 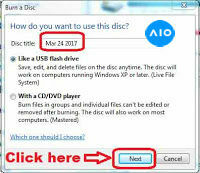 Hello friends today, we will teach you how to write / burn any CD / DVD without any Burning Software in Windows, just by following the steps. What is Burning a CD / DVD? Burning is a colloquial term that means to write down content content to a CD, DVD, or different recordable disc. 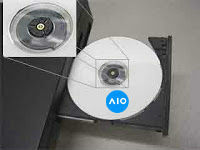 DVD and CD drives with recording capabilities (sometimes called DVD or CD burner) etch data on the disks with a laser. Burning a CD / DVD in easy words means putting a file or folder on a CD or a DVD. What is Live File System? Live File System is a term that Microsoft company uses for Microsoft Windows Vista and later versions to create Packet Writing Method and Discs, which allows files to be incrementally added to the media. Step 1: First, put a Blank CD / DVD in the CD / DVD Drive of your computer or Laptop, in which you have to enter data. Step 2: Then click on the Start button on your computer or Laptop and open My Computer. Step 3: Open Disc Drive after opening My Computer. Here we are using Blank CD. Step 4: When you double click on the disk drive, a dialog box will open in front of you how you want to use this disc. There will be two options for burning disc. Select the type of file you want to burn, and then click on Next Button. A) Like a USB Flash Drive - With the help of this option, you can delete, edit, save data in your disk at any time, but you can then use the disc only on computers, after which any of the following Windows XP OS and which supports the Live File System. Select this option only if you want to burn a document or file. If you have a CD-R or DVD-R disc, then you can not use this option. B) With a CD / DVD Player - With the help of this option you can not delete, edit, save the data present in your disk, but you can also use this disc in the CD / DVD Player. Select this option only if you want to burn an audio or video file. Step 5: Then Simply drag and drop your selected data to the disc or Copy and then click on Burn Disc. Step 6: After this you will open a Dialog box in which you must select Disc Title and Recording Speed. Note that if you select more Recording Speed ​​more then it will burn the data quickly, but the chances of having Data Loss are increased and if you select less Recording Speed ​​then your data will take a little time to burn but the data in it There will be no chances of being lost. 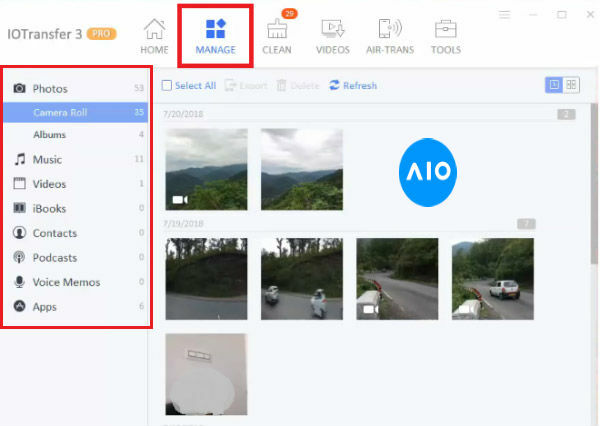 Therefore, to keep data well, the Recording Speed ​​should be kept low. 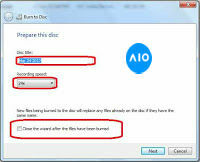 After selecting the Record Speed ​​Speed, you can choose to close the wizard after the files have been burnt. When your data is burnt, the Wizard will close itself or you can click on Next Button and then Data Burning will start process and then you will have to click on Finish Burning. After this your data will be burnt in a CD or DVD and then you can see it running in your CD / DVD Player or Computer / Laptop. You probably have heard stories of people earning on YouTube and thought, "Hey, I can do it too!" Although earning thousands is not real, but you can start earning money fast, especially if your subscriber base is strong. 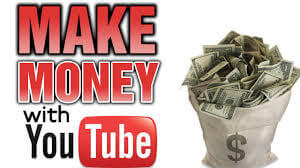 Follow this guide to monetize your video and start earning money from those youtube ads. this is easy! 1.) Create your Unique YouTube channel: Your channel is your Indiviual presence on YouTube. Each channel is connected with a YouTube account. 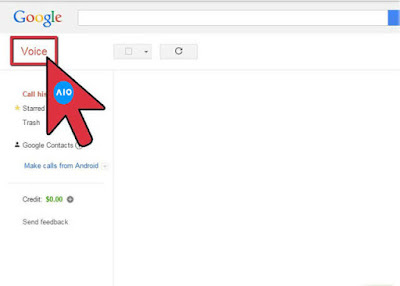 YouTube's account is as same as to a Google account, and after creating your YouTube account, you will be able to use other Google products such as Gmail and Drive. At First, You must create a new account or use your existing account. Add keywords to help people find your channel. 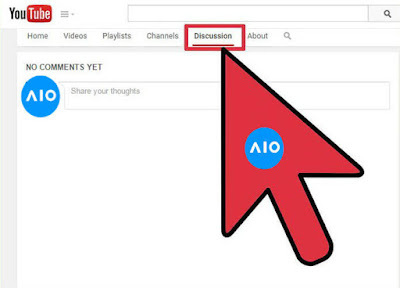 You can add your keywords by navigating to the Advanced section of your youtube channel settings. 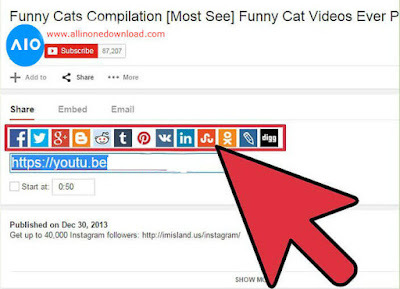 Ensure that your keywords fit in the content of your youtube channel. Your username can work on your own interests and also work against you. If it is small, easy to read, easy to remember and real, then people will be able to remember you. However, if you are using your existing account, use it only. Changing your accounts will not help you. 2.) 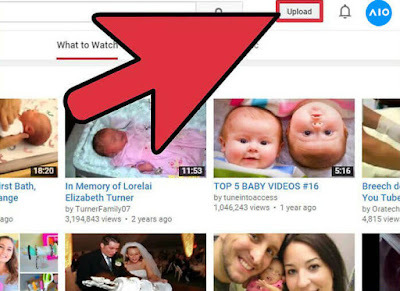 Upload a video to YouTube: Try uploading content that is of high quality and is not too long. (This option may vary depending on what kind of content you decide to upload) Also try uploading regularly and be consistent with your upload. Even if your vedio content's is not very good at the beginning, Always stay with it. Practice makes perfect, that's why always try to make each video better than the previous video. Often you learn by working. Improve your vedio content with the help of a better camera or better editing software or better technology. Also, improve the way you film things. Use a tripod or get help from a friend and publish your scenes well. All this things helps for a better end product, which helps you get a better audience on your youtube channel. Regular uploading and updating can keep you holding on to your audience on your youtube channel. If you put your video contents on a regular schedule and will keep that schedule as routine as possible, then people are more likely to subscribe. Make sure about that you have tagged your video with appropriate keywords that perfectly describe your subject matter as well as have a pleasing description in it. With this descriptions help people will be able to access your videos in YouTube searches. 3.) Increase your subscribers: Subscribers are important for increasing your monetization. You need people to see your ad so that you can earn money from it. There is no secret to finding more subscribers, just make as good a subject as you can and viewers will come by themselves. Keep uploading your subject matter and try to stop people to see it. Put your video on twitter and facebook Share it with people. Distribute it somewhere else on the Internet. All members must be a participant. Answer your audience's comments and talk to them and make videos related directly to their comments and questions sometimes. Sometimes Joining with your community will bring more members to that community. 4.) Monetize your video: To start earning money on your video, you will need to enable monetization. 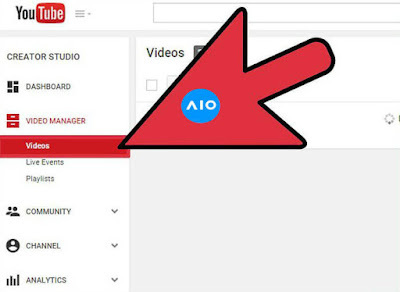 This means that you are allowing YouTube to place an advertisement in your video. From this, you also acknowledge that there is no copyrighted material in your video. You can monetize after clicking on the Monetization tab, and then selecting the "Monetize With Ads" box, after uploading a video. After you upload it to monetize your video, open your Video Manager and click on the "$" icon next to the video you want to pay. Tick ​​the box "Monetize With Ads". 5.) 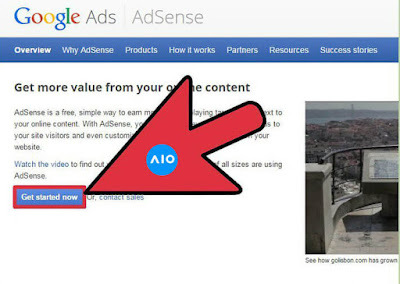 Set up Google Adsense: You can set up Google Adsense for free by visiting the AdSense website. Then click on the Sign Up Now button to begin creating your account. You must be 18 years or older for creating an AdSense account. If your age is less than that, then you will need an adult for your help. You will need PayPal or a bank account and a valid mailing address as well as some other information so that AdSense can ensure who you are and who to send money to. You earn money when the ad is clicked and every view gets a little amount, but it keeps growing over time. That is why being an audience is a major necessity. 6.) 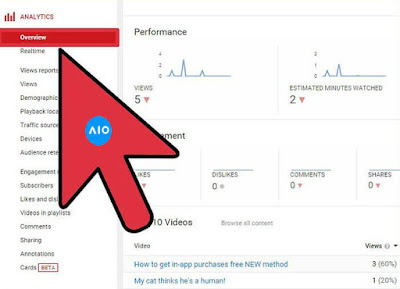 Check your analytics: Once your videos are online, monitized and are being watched, you can check the analytics to know their performance. Click analytics option in your channel menu. Here you can see your estimated earnings, ad performance, video ideas, demographics etc. Using these tools, you can see how the effect of your subject matter is on the audience. If you feel that you are not able to attract the right audience, then you can change your subject Vaastu or Marketing. 7.) Advertise your video in another place: Do not insert your video on YouTube only! Start a blog, create a website or insert your video on other video or social media sites. The more views you get, the better. By sharing a link or embedting your video on the Internet, you are increasing the chance of showing it and earning money. 8.) Become a YouTube Partner: YouTube Partners are a YouTube member who monetized videos with a large number of viewers. Partners gain access to more content creation devices and they can win prizes for their audience. Partners have access to more community support and suggestions. 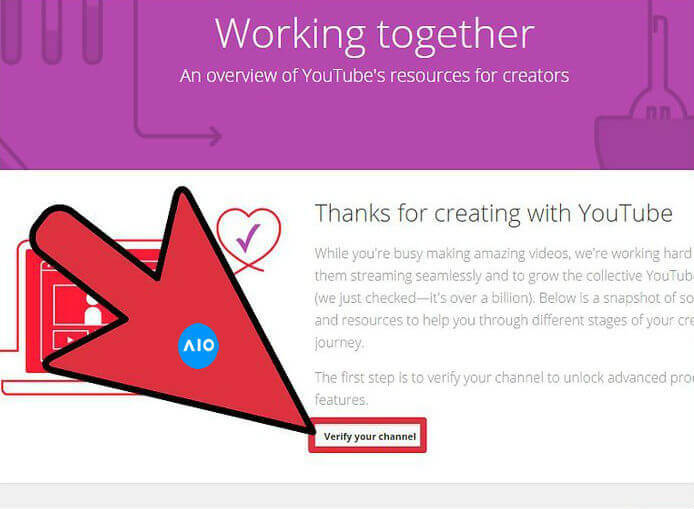 You can request YouTube Partnership at any time from the YouTube Partner page. To get access to the most powerful partner program, you need 15,000 Watch Hours for your channel in the last 90 days. Enter time and effort in your video editing. Videos make good topics architectural and quality. Use keywords so that people can watch your video. Create an account on social networking site (Facebook, Twitter, etc) and do your own ad! When uploading the video, make sure you enter the tags. Make a video based on what's popular on the internet. Share your video on social networking sites like Facebook, Twitter, etc. Some people can leave the meany comments to bring you down. Do not let them get discouraged. Copyrighted content can delete your video, and possibly even restrict it. If your video contains any copyright material (i.e. - music that is not created by yourself, content taken from movies, etc. ), then your chances of joining the partner program are reduced. Most people do not earn much from YouTube Partnership. Unless you get big success, do not make a job-free life plan. If you have any reason to believe that there might be a tap of your cell phone or land line, then here are some pointers, to help you confirm this suspicion. Will meet Such signs can be found even for some other reasons, but still you do not have to depend on just one symptom but rather to concentrate on every kind of symptoms. After you have enough evidence, you can ask for any legal help. 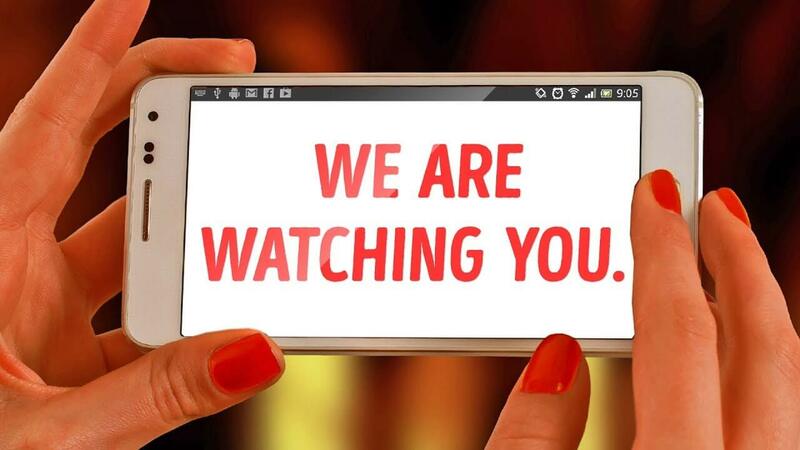 Here are some traits that can confirm that someone has installed such a device in your phone. 1.) When your secret is exposed, then be careful: if any of your information, which only a few trusted people know, can come out suddenly, and it may happen that If you share this information with someone on the phone, then it is likely that your information has probably come out through your phone. One of the reasons for this may also be that you are probably the reason for your spat, because of which you are being spied on. For example, if you are on a high post in a company that has many opponents, then maybe you can be spied on. On the other hand, there may be some very common reasons for your phone to be taped, as if you are going to be divorced now. And the person you want to get this kind of information by tapping the phone of your spouse, who can help him get a divorce. 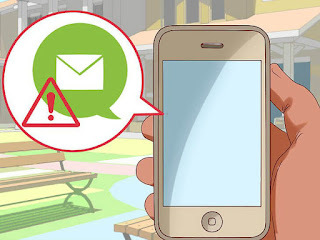 If you want to check this, you should share some information with a dependable person on your phone, which is not really so important, but you should say repeatedly to him on the phone, that this The information is extremely important and you do not tell it to anyone. If this information comes out, then understand that someone is listening to you. 2.) If you have recently suffered some kind of theft, then be wary:  If your house lock got broken, but no precious things have been stolen from the house So, be careful, because something can be wrong. It can also happen, that someone entered the house of your house and installed a wiretap in your phone. 1.) Note the voices from the rear: If you are having some sound steadily while talking to someone on the phone, or if any other kind of voices are coming, then it is expected that, That these voices are arising due to tape. However, this is not an appropriate sign, because such voices may occur, due to weather breakdown or due to poor connections. Fixed, some scratching sounds may also come in the way of the two conductor's capacitive discharge. The extremely powerful voice can also be a big sign. You can also check the sound with the help of sound-bandwidth sensor, which your ears can not hear at low frequency. If the indicator is showing repeatedly in a single minute, then your phone is being tapped. 2.) 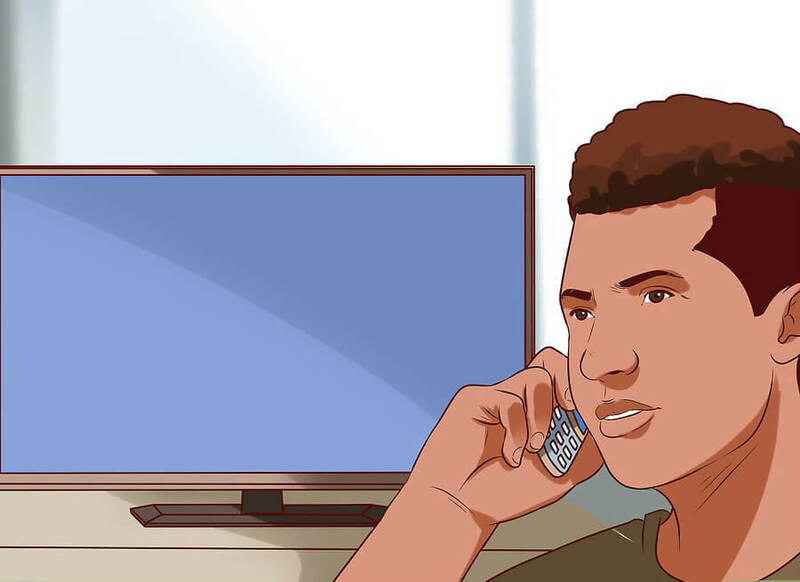 Take your phone to another electronic device: If you feel like you are being taped, then now whenever you talk on the phone, go through the radio or TV. . 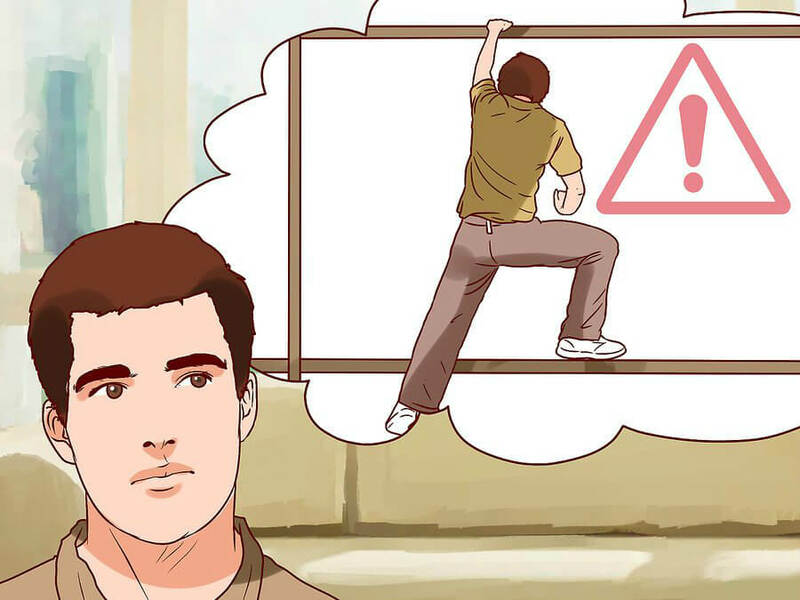 Even if you have never felt any deviation before, but there is a possibility that if you are in front of an electronic device or standing, then some kind of deviation will be felt. It may be that when you are not using the phone, you still hear some deviation in this. An active wireless phone can sometimes interfere with the transmission of data without installing any additional software or hardware, but an inactive phone never does this. 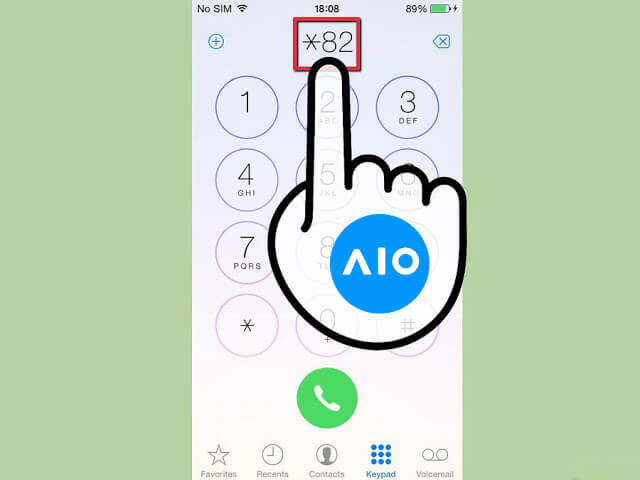 Some bugs and tapes use close frequency of FM radio, so whenever you have a stir on the radio while dialing a phone number, then it is possible that any of these devices are being used. Similarly, on tape, on UHF channels, TV broadcast distractions are distracted. So to understand any kind of deviation, use a TV antenna in the room. 3.) When the phone is not being used, listen to it: When you are not using your phone, then it should remain in peace. But if you hear any kind of beep, clicking, or similar kind of sounds, even if you are not used to it, then maybe some kind of taping device or software or hardware has been installed in it. In particular, pay attention to the vibration of static noise. 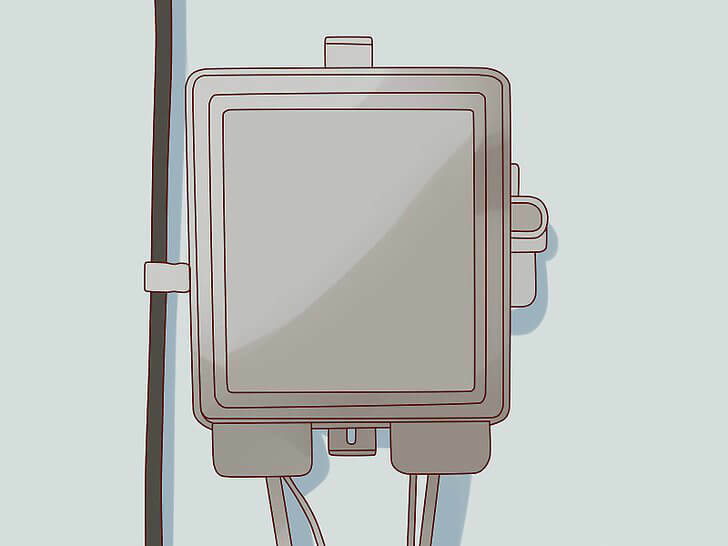 If such a thing happens, the microphone and other speakers are activated through a hook switch whip, while not using the phone. Then, any discussion made on the phone within 20 feet (6 m) radius can be heard. Regarding landline, if you can hear the dial tone without touching your phone, it is also a sign of your phone's taping. Then confirm this voice through an additional amplifier. 1.) 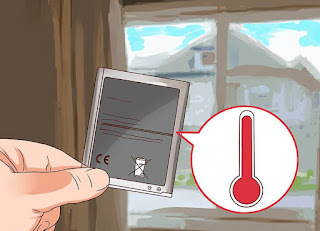 Note the temperature of the battery:  If the phone's battery is used without using it or it gets hot for no reason, then perhaps the tape software is running in the background and due to which The battery of the phone is being used continuously. Of course, the battery is too hot, because you are using it more and more continuously. And it can be even more possible when your phone is more than a year old, because the battery gets damaged over time, then this problem is a common problem. 2.) 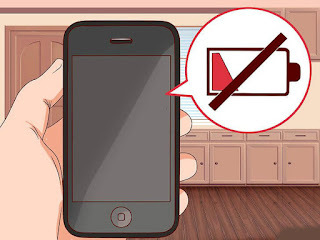 Note, how often do you have to charge the phone's battery: If the battery life of your phone is reduced without any reason, you have to charge twice the normal amount of battery, One reason for this to happen so quickly is that the tape software is running continuously and using your battery. You also need to take care of how much you are using your phone. If you are using it more than the limit, then it is a common practice that you have to charge your phone repeatedly. This is applicable only when you are not using your phone at all, or using less than usual. If you want, you can monitor your smart phone's battery life by using any of these BatteryLife LX or Battery LEDs. Also note that the battery of any cell phone loses its ability to stay charging for longer time. If you are getting similar changes from year to year, then this is the result of your phone's battery being used more and exceeding the extent. 3.) 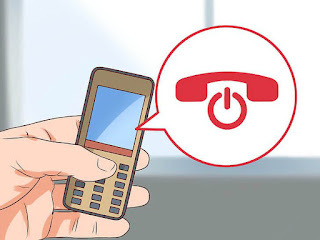 Try to shut down your phone: If the process of shutdown is taking a lot of time or is not getting complete, then it is pointing out that your phone is controlled by another through tape Has been doing. Pay close attention to this, if you do not take much longer than usual to get a cell phone shutdown, or even after the shutdown, the back light keeps on burning. 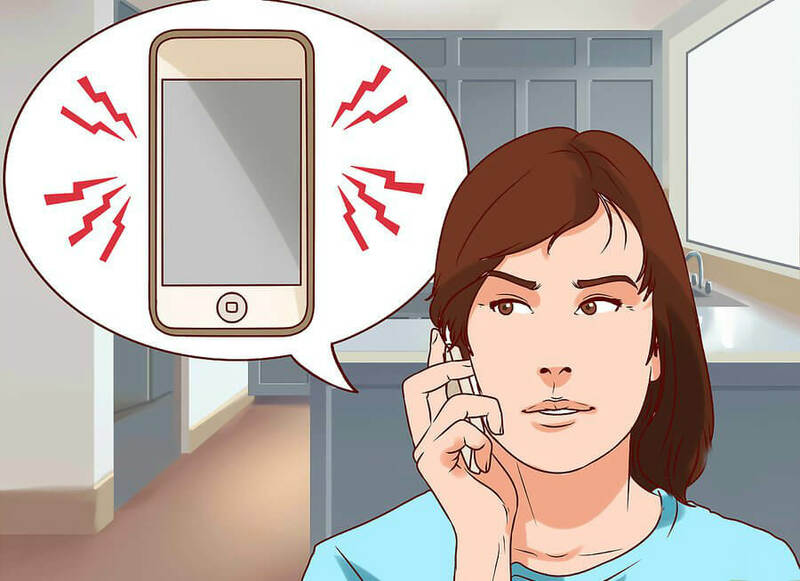 Although all these are signs of taping of your cell phone, but these can be the result of any problems encountered by your phone's software or hardware, which have nothing to do with the tape. 4.) 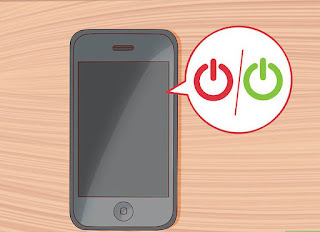 Focus on some irregular activities: If your phone's light is done without you, it is automatically turned on, the phone is automatically shutdown or started, or you start automatically installing any app So, it can happen, that someone hacked your phone and is controlling it through the tape. On the other hand, such irregular deviation is also due to data transmission. 5.) 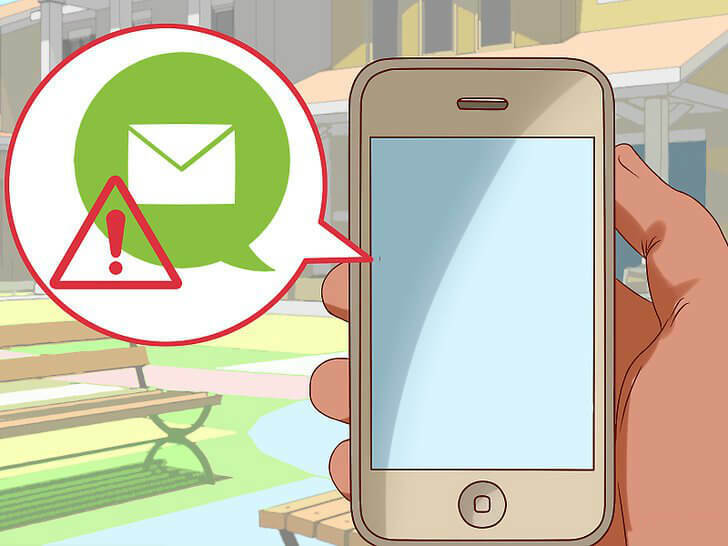 Focus on some strange text messages: If you have ever received a strange message from any unknown sensor, in which a lot of words or nabars have been used irregularly, then This type of message is a threat bell to tap your phone. Some programs send such a strange message as a command to control that phone. If you have any such software installed on your phone, you can get such messages. 6.) Pay more attention to your phone bill: If the amount of data has increased a lot suddenly, and you know that you have not used so much data, then there is no such thing as Using your data via phone tape. Many such espionage programs send your phone records to the online server and use your own data plan to do this. Older programs used large amounts of data, due to which they could easily be caught, but it is not so easy to catch today's programs, because they use data in lesser quantity. 1. Check the surroundings of your surroundings: If you suspect that your landline is being tapped, then carefully examine all around you. If there is something that is not in its place, or is different from its location, then do not let it understand that there was an earthquake here, due to which all this has happened here. It can also be proof that someone has done something in your home in your absence. 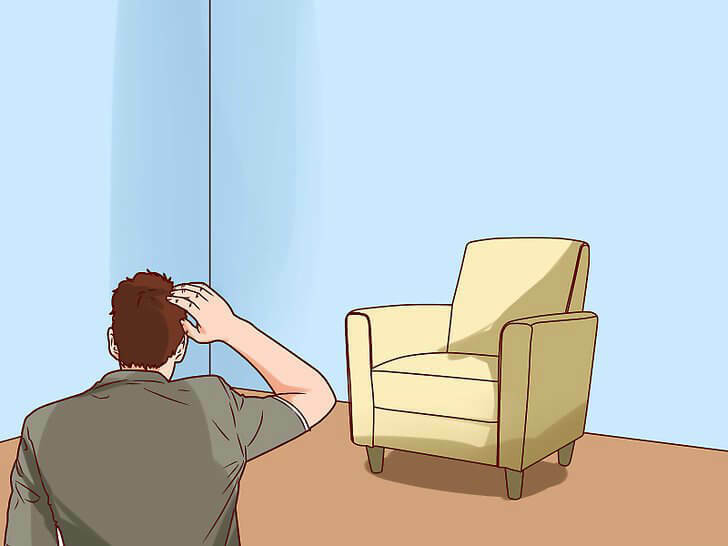 It may be that a wiretapper has moved your furniture to get an electrical line or phone line, so that's why it is very important to keep this in mind. Especially note your wall plates. 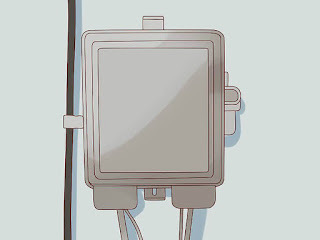 In the room, you have to look carefully at the wall plates present near your phone connection. If they are seen from their place shaken, then this only means that someone has tampered with them. 2.) Look at the outer side of the phone box: Maybe, you do not know what a phone looks from inside, but if you still want to get some idea, then see it once Take it. If this box looks a bit shaken, then it might be that someone teased it to install wiretap. If you are seeing any such hardware, which has been installed very oddly, even if you do not have any information about this, but still you should think that someone's phone Touched. Focus on the restricted area of ​​your box. There is a need for a different key for this box, but if you take a little bit of it here, then understand that there is a problem. 3.) 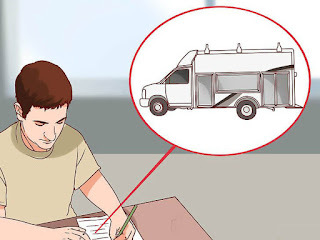 Note, if you are seeing trucks full of most number of goods: If you are seeing a large number of trucks in front of you, this indicates that the truck is a luggage They are not trucks, but they are trucks of people who are taping your phone and here again and again, just going to repair their wiretaps. If you did not see any person coming out of these trucks, then there would be no meaning for this. 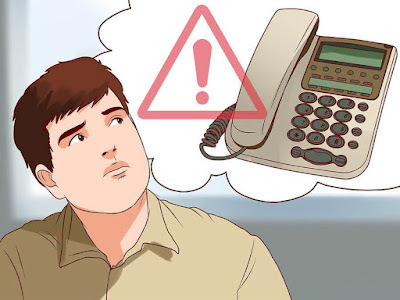 Typically, people listening through a bug on landline are in the range of 500 to 700 feet (152 to 213 meters) from the normal. These will have tinted windows in trains. 4.) Beware of some mysterious repair men: If any person comes to your home, who says that he came from your telephone company or is a repairman, but you do not have any such complaints and applications related to your telephone If any repairs should come to your home, then it is a danger to you. So to confirm his identity in this way - call your phone company immediately or the company he is talking about - call. Whenever phone calls to the company, use the same phone number that you already have. Do not use any number given by that stranger. Even if the identity of that person is confirmed, even though the repairman is in your house, you have to monitor his activities very carefully. 1.) Use a tape detector: A tape detector is a physical device that you can use in the phone. As the name of this is showing, it can catch any external signals and tapes, and informs you that your doubt is true, and there is someone else who is listening to your phone call Is finding out. 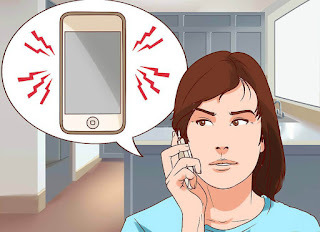 There are many questions on the utility of all these devices, but these devices are very useful in terms of catching any kind of wiretap, and any device that you want to get the information about the tape, check the phone line During every such type of electrical or signal should be able to catch the change. So look for a device that can capture the changes in the frequency with imprinence and capacitance. 2.) 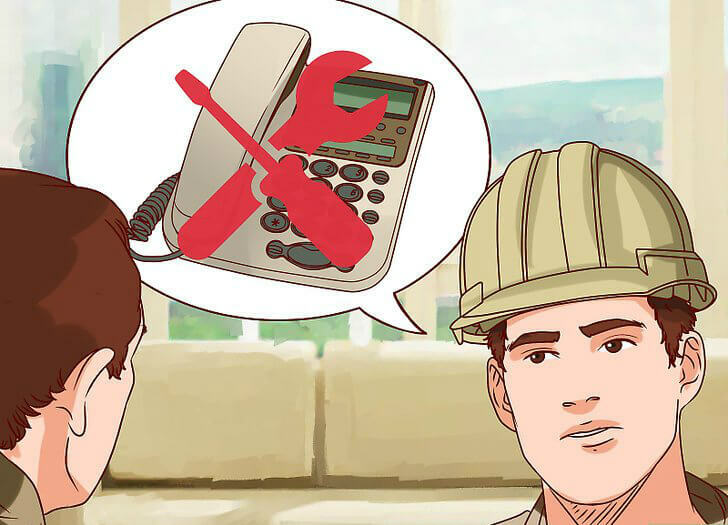 Install an app: On any smartphone, you can install a kind of Tape Detector app, which will allow you to use any type of tape signal or phone data you receive on your phone. Could give information. There are ongoing discussions on the effects of such applications, so you are less likely to get any confirmed proof even through these. Some apps like this, installed by someone on your phone, are just worth confirming some kind of bug. The apps that confirm the capture of the bug include Reveal: Anti SMS Spy app. 3.) Ask for help from your phone service: If you really think that your phone is being tapped, then apply for it at your Phone Service Office to come and call some professional materials from your phone. investigate. With some standards being provided by the phone company, it can be confirmed that there is an illegal wiretap present on it, taping of it, having low frequency device and another line in line with the phone line. Keep in mind, even after requesting to verify your wiretap, the phone company rejects your request or says that if there is no evidence of this fact after doing a lot of research, then understand that this work Government approval is being done. 4.) Go to the police: If you have any solid evidence of taping your phone in it, then if you wish, then the police can also take help to investigate this. With this you can also catch the person who tapped your phone with their help. Many police departments have such material that can be used to locate a device used for phone bugs or phone tape, but if you have any concrete proof to confirm this , Then maybe they will not be ready to use all these tools. 1.) 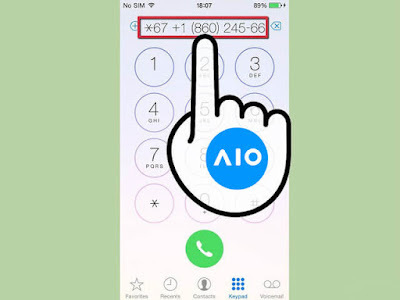 Pick up the phone: If you are using a mobile phone, open your dialer. 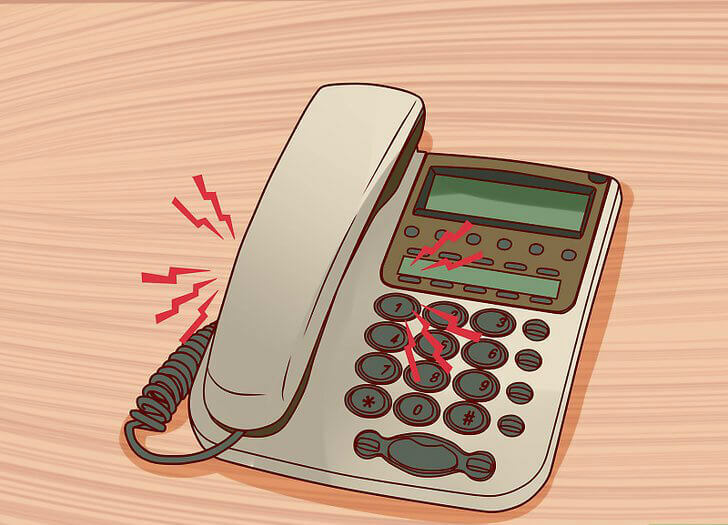 If you are using landline then wait for the dial tone to be played. 2.) 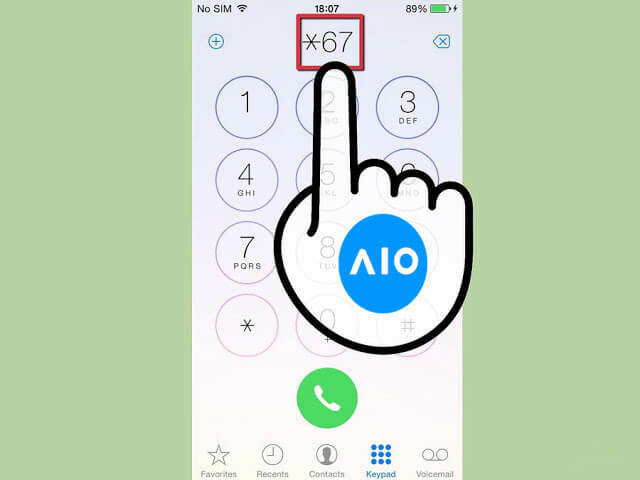 Insert the blocking code: Caller ID will stop the broadcast for calls made using the blocking code. 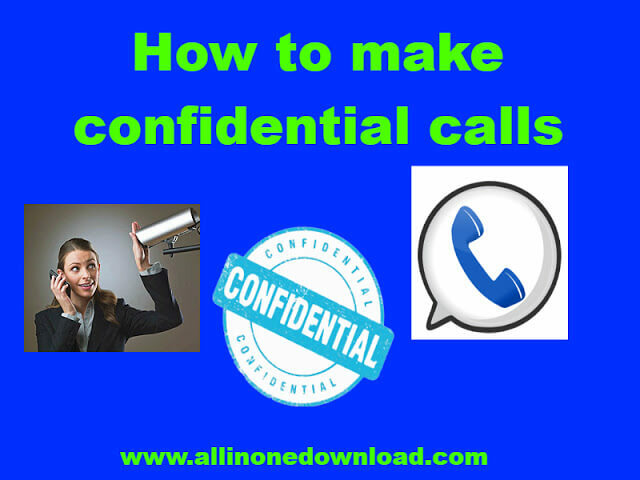 Every phone call that you want to make private will need to be inserted before doing it. This code works for both mobile phones and landlines. UK - Dial 141 It is valid for almost all service providers. 141 , although some service providers charge for its usage. Get detailed information about your plan by calling your phone service provider's customer service. 3.) Dial the phone number: To make long distance calls, please include national and regional codes. 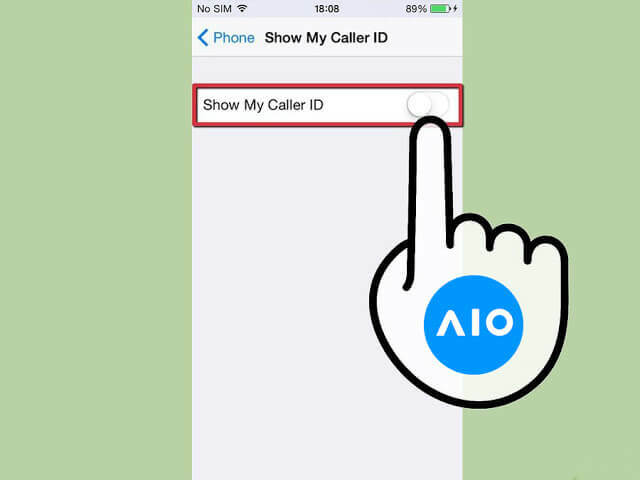 Your call will go normally but your name on receiver caller ID will appear as "Unknown", "Blocked" or "Private". 4.) Set permanently blocked: You can also do the configuration of your line to be shown as private forever. To do this, contact your call-carrier and talk about setting up a barrier service for the line you want to block. 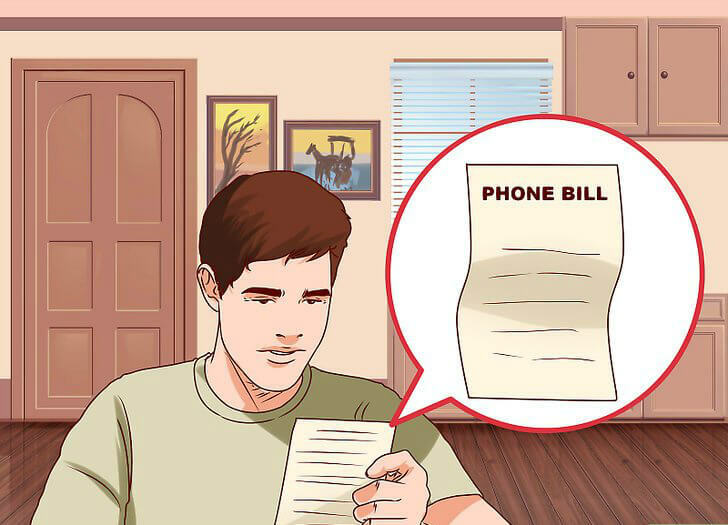 If the recipient is using an anonymous phone rejection service, then you will not be able to contact them until you dial * 82 (US) or 1470 (UK) before dialing the number. This will temporarily disable your personal status. 5.) Stop broadcasting your caller ID on iPhone: If you are using an iPhone, you can activate 'Caller ID transmission off' in the settings menu. Open the Settings app on your Home screen. 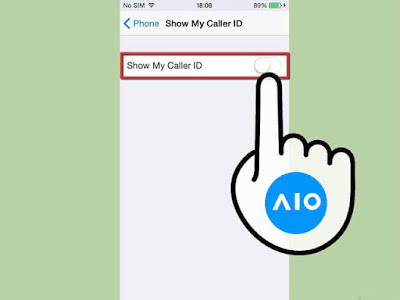 Tap; Settings → Phone → Put "Show My Caller ID" on OFF. It is not available on all services. For example, Verizon iPhones does not offer this option. 6.) Use Google Voice: Google Voice lets all your calls forward through an unknown number. 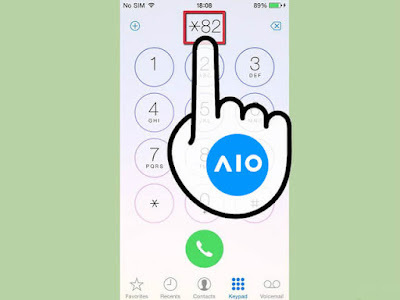 By using it you can hide your actual phone number from unwanted ones. Google Voice can work only for mobile phones. In the Emirates, from Abu Dhabi to Dubai and Ras Al Khaimah, the sky is planned to be played in the new year, many spectacular fireworks have been displayed. Here in United Arab Emirates, we do not work, so you can expect some serious show including two world record breaking efforts. Burj Khalifa's fireworks are also returning to the ring in 2019 with the return of popular performance of Al-Marah Island. The firework display of the famous New Year's Eve in downtown Dubai last year was replaced with laser show, but in 2019, the organizer Emaar Properties has promised another superb performance of fireworks so far that it is safely controlled Will go. In fact, 4,000 police officers - 2,000 patrols and 2,000 security guards - are being deployed to keep the area safe, because two million people fall downtown in downtown Dubai to become witnesses to the incident. The Burj Khalifa # EmaarNYE2019 show will start from 11.57pm on December 31 and will include the lights, lasers and fireworks on and around the world's tallest building. Also, Dubai Fountain offers a special tailor-made exhibition, discover food and drink shops at the South Ridge Lawn and a live DJ set in Burj Park, where there will be more food and beverage outlets. If you are one of the lucky people who booked tickets for Gala Dinner selling Atlantis the Palm, then you have a front seat on one of the city's most spectacular fireworks exhibitions. For those who can make free entry to the 11-km Boardwalk area of ​​Palm Jumeirah, which offers a spectacular view of the hotel and midnight show. Perhaps the most notable hotel in Dubai - "Seven Star" Burj Al Arab - is known for showing an impressive firework every year. This year is no different. Landmark fireworks of the iconic city will work as a very installable backdrop for the demonstration. If you eat at the hotel or in one of the restaurants of Madinat Jumeirah, you have already booked the correct viewing place. To catch it for free, Kite is one of the best places to go to the beach, which is a public area adjacent to Burj Al Arab. But it will be very busy, so you can stand far off from the beach, even in Umm Sukim, and still get a good view. Since sunset, the show will start and four fireworks will be closed at 9:00 am and midnight between hours. In the new year you will also find a live band there for dancing and singing. Midnight skies will also be illuminated with a spectacular firework display from Dubai's newest beachfront spots. From 6 pm, La Mer is hosting beach parties by 1 pm under the leadership of North and South, DJ, R & B, Home, Hip-Hop and Pop Tunes. Not only will there be fireworks but also a spectacular LED light show, as well as many gweezers. You can dine in the beach or any restaurant in the area to get a good view. One of the new waterfront spots in Dubai is Al Saif, where AJ and the band and DJ Tones perform live on the eve of New Year so that you can dance nightly in the form of a firework display ring in 2019. This area merges Dubai Creek's old world charm. With a contemporary setting, where more than 50 creek-side restaurants are hosting a special New Year eve package and offering the best seats in the house to catch a sparkling midnight show. Why not check the door freestyle grill and order 23-carat gold-coated fish - and say hello in the real style of Dubai in 2019? Abu Dhabi is ready to finish the disclosures 2018 with a bang - a world record as well as the display of fireworks illuminated the sky. 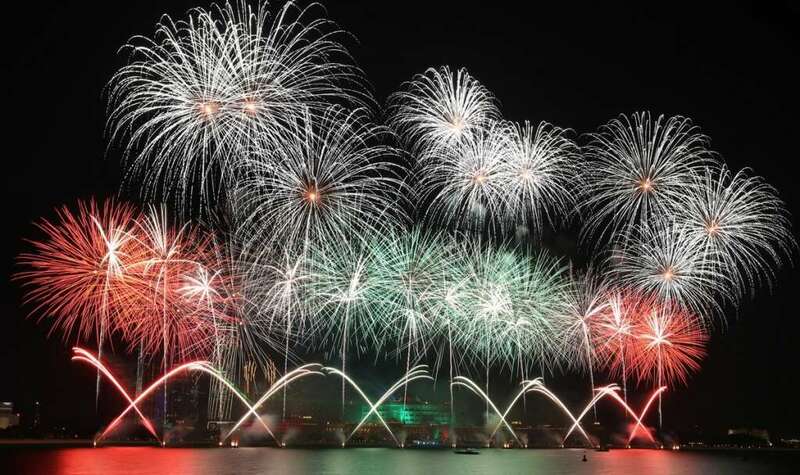 A 10-minute light show in Corniche aims to break the Guinness World Records for the country and create 'Happy New Year 2019'. Using an array of colors and configurations, the performance will reach a height of 40 meters. Celebrating the new year of Al Marah Island is one of the most popular in Abu Dhabi, in which two of the world's most favorite singers - Amar Diab of Egypt and Marim Ferre of Lebanon - perform a free concert. After their performance there will be a big midnight firework display - but you want to go there early because it is expected to be very busy, and parking is limited. Yes Island will light up with an incredible midnight show after the traditional countdown. The exhibition will take place in the marina, the bar and the restaurant can see lots of places with water view. However, anyone who is planning to go there is advised to get down soon because he is expected to be busy. With a party on the Palace Trace, the stars in the New Year under the stars, which will end on the beach with the performance of midnight fireworks. If you missed the ticket, you would still see fireworks from Corniche or Marina Village water. Ras Al Khaimah will aim to create a new Guinness World Record with its 2019 fireworks, which hopes to take the title of the longest straight line performance. The rocket will be closed 11.83 km, making an incredible 12-minute display, which will be visible from three major locations. This effort will be in Al Marjan Island, which will have additional visual areas in Al Shohda Street and Al Wassal Street. There are 27,000 free parking spaces in the three viewing areas. In Sharjah there will be a spectacular 10 minute firework show in the ring in 2019. This exhibition will be in Al Majaz Waterfront, one of Sharjah's top family places. Launching from 16 halves, the exhibition will be set for contemporary music and in a special light show in nearby Sharjah Fountain.